Several people might believe that the Highway of Death is the name for some Hollywood film. Certainly, there are numerous films that replicate real life battlefields, but the Highway of Death is a real road located between Iraq and Kuwait. Perhaps you recall reading in the early nineties about the seven-month Gulf War in which the United States took part. Towards the end of the war, Iraq decided to surrender, since they were being attacked by a coalition of 34 nations. Nonetheless, there was a growing fear that the Iraqi troops would regroup, so they were attacked while they cruised Highway 80 and 8. At the end, there was a trail of burnt vehicles and a defeated Iraqi force. The Gulf War was started because of the insistence of Iraq on invading Kuwait. 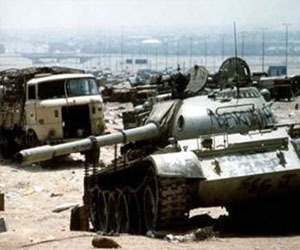 On August 2, 1990 Iraq deliberately decided to invade Kuwait and intended to annex it to their country. Obviously, this wasn't seen with good eyes around the world. The truth is not only the coalition of 34 nations was against the attack perpetrated by Iraq, but also the majority of the nations around the world. The President of the U.S. was George Bush Sr., and he immediately reached out to the Saudi Arabian nation. When it came time for the attack of the Highway of Death – which happens to be between the two countries –the U.S. and Saudi Arabia were the major defenders of Kuwait. Iraq was in a tight spot with an increasing debt that was owed to Kuwait and also Saudi Arabia. They attempted to convince the two nations to condone the debt, but this request was refused. Later on, Iraq decided to accuse Kuwait of decreasing the price of oil. Since Iraq's economy depended on the production of oil, they were suddenly in a very complex position. Before the Highway of Death incident, Iraq insisted on saying that Kuwait was actually a part of their country, and that it should be given back to them. The tensionworsened, until they decided it was time to simply take Kuwait by surprise and declare their sovereignty over them. They bombarded Kuwait City, taking the main highway – later to be known as the Highway of Death. On their way back, they encountered the counterattack from the coalition. The U.S. and Iraq had been in conflict since the Cold War era. The reason behind this was the fact that Soviet Union had backed up Iraq in their ideology, which in turn was against the United States. Nonetheless, the U.S. made an attempt to work things out with Iraq diplomatically. Since such attempt failed, the conflict continued until it led to the bombing at the Highway of Death. The trail that was left behind covered the two main roads – Highway 80 and 8, and the death toll is unknown to this day. Some newspapers and journalists estimate that therewas an estimation of 100,000 dead Iraqi soldiers during the war. However, it isn't clear if this includes the casualties at the Highway of Death site.